Excited to announce that production version just went live. If you are a Tax Agent, please go-ahead and signup for free and give it a whirl. Except invoicing and mobile apps, everything else should be working. Within few days we are expected to complete mobile apps and get the payment system setup. 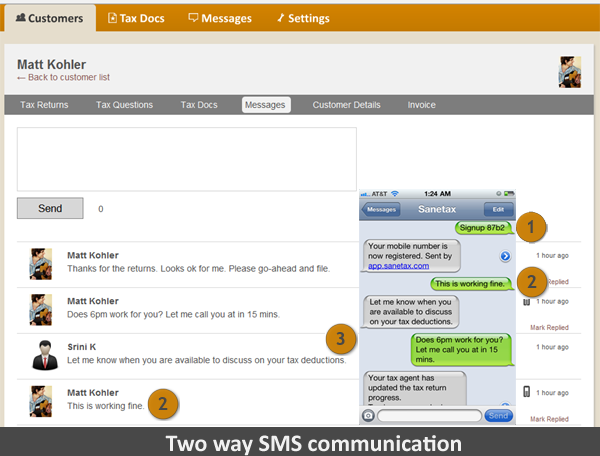 Let me take this opportunity to introduce much awaited two way SMS feature. For illustration purposes, I have included an iphone screenshot but any mobile phone with SMS enabled should work just fine. 1. Customer registers his mobile phone number by sending a 4 digit code (instructions are generated by a setup wizard once they login to the site). This is a security check so that wrong phone number is not registered in the system. If customer doesn't have access to the computer, Tax Agents can set this up. 2. Customer starts communicating from their mobile phone. Same message appears under Messages tab. 3. Tax Agent replies back through the Sanetax website. Reply is delivered to customer as an SMS. 0 Responses on "Sanetax production version is released"